For my first SEO post, I’m going to be writing about something a little more advanced and something hopefully you never have to deal with. I really wanted my first post on SEO to be about something fun like in-content SEO, but I’ll be writing about how I’m dealing with a manual actions penalty from Google due to unnatural links. I’ll be documenting my journey to keep track of and record what actions I’m taking. And also show the almighty powerful Google that I really am doing everything I can to be a nice team player. I’m hoping the outcome will be good, but even if I am unable to get rid of this penalty, I will show you all the steps I took and maybe some of you penalty experts can provide some insight. WHAT IS A GOOGLE LINK PENALTY? There was a time, when ranking your website to the very top of Google’s first page, was easily done by having other websites link to your own. Webmasters and internet marketers went on a binge adding thousands and thousands of links. There were programs that would accomplish this in a matter of seconds. Then there were those who were even more crafty with this practice. They would buy used domain names that had high authority and build full websites for the sole purpose of linking to their “real” sites. I really never fully understood this practice. To me, if you are going to put in the time to build a full website, why not build a real website in the same niche of your other website and link naturally among your websites the way big corporations do? Some people even made a ton of money by selling links to people. The names of these websites were called PBN’s or Private Blog Networks. Google eventually caught on. And as a result, they started penalizing sites that were using these “black hat” methods. Sites that ranked on the first page, were no longer ranking. A lot of people who relied on these PBN’s lost a lot of money once Google took action. And many decided never to do this again. Although people still do this, many just don’t want to live in fear, and prefer to link build the right way. Also, Google seems to be placing less importance on links and more importance on content and user experience. DO I NEED TO WORRY ABOUT A GOOGLE LINK PENALTY? Most people will not have to worry about a penalty like this. Now, if you are spamming forums with your website and submitting your website to spammy looking directories, then you do have to worry about it. And of course, if you are using a PBN, then you definitely need to worry. HOW DID I GET HIT WITH THIS PENALTY? I’ve never really link built. In fact, I got into the SEO game a little late and I’m learning a lot along the way. I’ve mostly designed websites. Recently, I purchased an existing website. The site is ranking extremely well in Yahoo and Bing, but not as much in Google. That right there is your first indication that a site has been penalized. In my situation, it wasn’t caused by something that I actually did, which makes removing this penalty a lot harder since I will be unable to retrace the previous owners steps. There are many ways to tell, but the best way is really by adding your site to the Google Search Console (formerly named Google Webmaster Tools). Once in there, you are going to click on Manual Actions. If you don’t have anything in there, you are good (for now). But if you have a message, then chances are, it’s not a good sign. Google has detected a pattern of unnatural artificial, deceptive, or manipulative links pointing to pages on this site. These may be the result of buying links that pass PageRank or participating in link schemes. Learn More. I received the notification on 4/29/2015 with this penalty. When you receive this kind of penalty, you can request a manual review. This means that an actual human from Google’s spam team will look at your site and either revoke the penalty or keep it in place. The first thing I did since I wasn’t too savy with these penalties was immediately request a review. When you do so, you can write in the form provided why you feel you shouldn’t feel penalized. Since the site was brand new to me, and I had recently added it to Google Search Console, there weren’t any links pointing the site. So I really didn’t know what links Google was talking about. hello. I have purchased this site and looked at all the links to this site and didn’t see any spammy links. I have looked in GWT and clicked on “links to your site” and don’t see any links there either. I don’t see any spammy links pointing this site. If you can tell me where they are, I will disavow them. thank you for your help! I want this site to be a great resource for people visiting. OK. So for many of you experts reading this, you are probably laughing at what I wrote. Now I know! I’ll explain more about what I learned further down this post. I’ve been slapped with another penalty! As a result of your site having pure spam, Google has applied a manual spam action to #######/. There may be other actions on your site or parts of your site. I received a pure spam penalty! It seems that when someone went onto the site, not only did they not like the links, but they didn’t like the site! To give you some context. The site is an informational site in the travel and shopping niche. So even though I never wrote the content, it seems that the previous owner copied and pasted a few paragraphs here and there. I immediately went to the website Copyscape. This is a great website to determine if your site has duplicate content. I put in my website and I did in fact find duplicated content. You can’t tell who wrote the original article, but I imagine that my site was a duplicate. So I went to my site and deleted all the pages with this content and started writing from scratch. Now, keep in mind that by now I’m dealing with both an unnatural link penalty and a pure spam penalty. By this date, I went to the free version of ahrefs, which allows you to see 5 backlinks for free. I had a total of 6 links showing on ahrefs. I determined that 2 of those links out of the 5 looked spammy, and there was another link that didn’t look that great either, but it was a do not follow link. I then looked at the links provided by Google. But they only show the domain and not the actual link (I figured out how to get the actual link which I explain down below) so I didn’t know the specific link to disavow. If you are unable to delete an actual link, Google lets you disavow them. You are given plenty of warnings by them, that you should only resort to this tool, if you can no longer do anything else. This allows you to tell Google that you no longer want to be associated with certain links or entire domains. When you use the disavow tool, it doesn’t actually delete these links, it just doesn’t count against you. Hello, So this is a site that I recently purchased and I wanted to make sure I am abiding by all Google guidelines. The first thing I did was look at the links. I went to ahrefs and I did see two links in there that did look strange. I uploaded a disavow to these links. Also, I received a “spammy” site type of manual action. My site is a quick informational site that gives visitors information on a specific area. On my homepage, I went to www.copyscape.com to see if there was any duplicate content. Yes. In fact, I found that my main page was duplicated. I didn’t know if the other site copied mine, or if my site copied them, so I went ahead and deleted the whole page and just wrote it from scratch. I even have a link that goes to wikipedia to give the user more information about the town. I have also gone through the rest of the site and have rewritten the content. Again, it was difficult to rewrite content since a lot is information such as phone numbers and addresses. But I did as much as I could so that it would not be viewed as duplicate. I hope that all the changes I have made are to your satisfaction. If there is anything else that I need to change, I will. I have gone through the google documentation to see if there is anything else I am missing. Thank you for your consideration. 5/23/15 UPDATE: DENIED BUT IS THE PURE SPAM PENALTY GONE? On 5/23/15 I received the exact rejection message I had previously received from Google. So I went to my manual actions penalty link and I noticed the spam penalty gone! It’s strange that I didn’t get a message telling me that the pure spam penalty was revoked, but since I only see an unnatural links penalty in the manual actions section, I have to believe that it was taken away. At least that’s what I hope!? So now I really have to tackle this link penalty. They seem so friendly, personable and helpful on video. Which is a total contrast to what you get in your Google console! If only when the person who is reviewing your site could give you better information as to why exactly you are being penalized, that would make this process a lot easier to fix. I mean, if they are already manually reviewing your site, why not just write a sentence with some help? This time around, I went to Open Link Profiler which is a free link checker. I had 6 links showing. 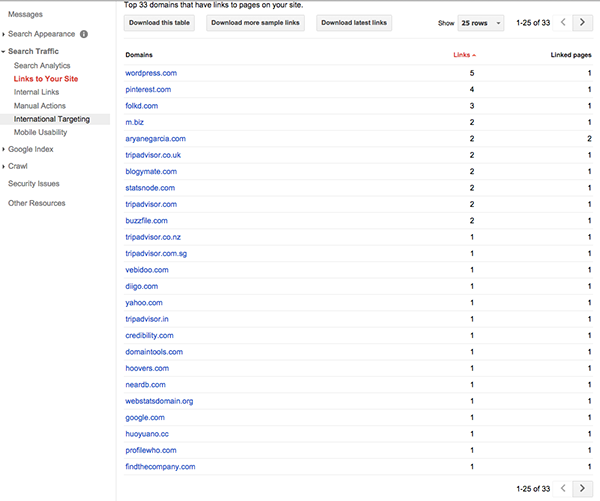 In Google, it showed a total of 33 domains linking to my site and 49 total links. I went to all the domains listed and visited the sites. If they looked spammy, I added them to my disavow file. For the actual links I found on Open Link Profiler, I clicked the link and was able to find a contact form and on another an email. So I sent them an email to see if I could remove my link. I ended up disavowing 5 URL and 20 domains. I kept domains such as sites that were linking from pinterest and tripadvisor. I figured by now, there are hardly any links left to remove. I purchased this site and I had nothing to do with the links for this site. When I added to my Webmaster account, I saw that a link penalty had been assessed. I looked at ahrefs and openlink profiler to see what links there were, and there weren’t many. I disavowed 2 and sent in a request. I was rejected again. I did notice the links were very different in the Webmaster link section. So I went in and studied those links. After the last communication from Google, I went and did research on how to fix this penalty. I came across a very informative video with Matt Cutts and Alex that explained how to fix it. I tried to reach out to several of the links that Google Webmaster (search console) has. Since many just show the domain, I wasn’t able to find the exact link page. For the few I was able to find, I went to the contact pages, but some said they don’t delete pages and others like blogspot.com I couldn’t get in there to remove the link, since I didn’t do this to this site. Again, I’ve only had this site for a few weeks so I didn’t do any of the linking. One thing to note that I took away is that Matt and Alex said they want to make sure no unnatural links are created that look spammy in the future. I intend to abide by this, as I also recently heard John Mueller say that links don’t even really help that much with web rankings. Content seems to be the future and this is what I want to do with this site. Create informative content, which you will see I started doing in the NEWS section of the site. I am linking to the spreadsheet I used to clean up this site’s links. https://drive.google.com/########### For links I didn’t get replies, which is the majority, I disavowed them. I believe there were 33 domains in total, and I kept the links from reputable sites. I am hoping this addresses all the issues for the unnatural link profile, as I barely have any more links left to disavow. Again, I will not be creating unnatural, spammy links in the future, as that’s not something I would want to focus on anyway. Many thanks for your reconsiderations. My letters are getting longer and more informative. Am hoping this does the trick. Google still didn’t revoke my link penalty. By now, there are very few links left to disavow, and the majority that are left are from WordPress.com, Pinterest.com and TripAdvisor.com. I’m going on a research spree, and I certainly have learned a lot since I first started this process. Even if I am unable to get rid of this penalty, I want to show the steps that I took just in case someone notices something I am missing. I also believe you can learn from your mistakes, so I want to show you some of the things I did wrong and some of the things I’m doing right. I also want to show that you just need to be very careful when building links to your site, even if you aren’t the one who initially built the links. I learned how to actually see the link in Google Search Console thanks to a member in the Warrior Forum. You have to download the link in a csv file. I’m not sure why Google doesn’t just show you the link on screen. I realized that I HAVE to buy a real link monitoring program. The top choices seem to be ahrefs, majestic, Moz Open Site Explorer and monitorbacklinks. The reason is you need to gather as many links as you possibly can. Google doesn’t give you all the links. And the services above don’t either as they all show different links. But having at least one, will give you a better overall picture. Plus, it’s always good to keep an eye on backlinks as others can spam your site and you should try and get rid of bad links as soon as you can. Even though I disavowed most of the domains, I was told that Google doesn’t want you to just disavow. They want you to put in some effort by contacting the sites. Even if that means finding their WHOIS info. So I will be doing this. I’ll have a more detailed spreadsheet of what I’m doing, and maybe even link to this blog so they can see what my thinking was behind trying to get rid of these links. Although I should upload my documentation in Google Drive as that seems to be their preference since they know it’s a secure site. I also picked up a tip that you need to add both versions of your site to Google Search Console as both could be showing different links. This means the www version and the non www version. Have you been hit with a Google link penalty and were you successful in getting rid of it? Agreed. Seems many SEO experts are saying that Google is beginning to place less emphasis on links, and more on other metrics. Natural links is always the better option.